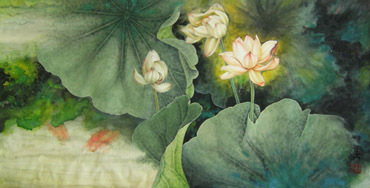 Lotus flower is one of the Eight Treasures of Buddhism. 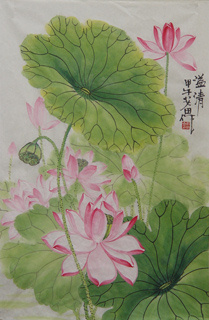 Some buddhist deities have lotus-shaped foundation, and lotus flower is regarded as a symbol of the Pure Land in Buddhism and represents the Buddha's noble and holy characters. 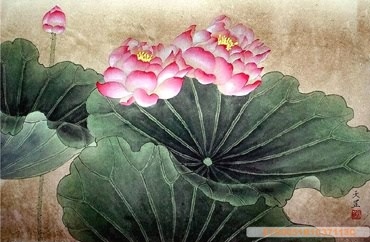 Lotus flower image almost becomes the sign of Buddhism. 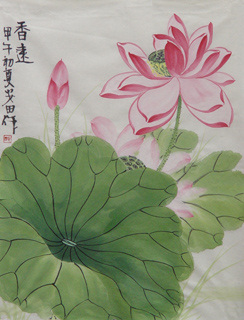 Chinese Lotus Painting: "lotus(莲)" sounds "lian" in Chinese, which is homonymous with "connect(连)", so it is very auspicious to hang the lotus painting in house(especially in the Japanese style rooms). It symbolizes "having lovely babies" or "happy and harmonious as you wishes". 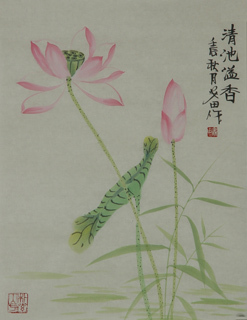 Chinese Fish & Lotus Fengshui Painting: Fish flirting with lotuses. This combination has the meaning of "living in affluence" and "every year may you always get more than you wish for". 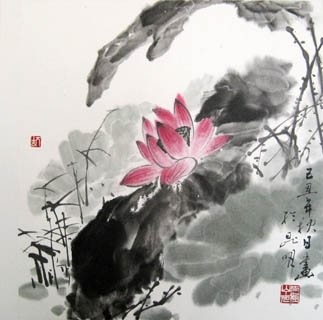 In ancient China, the lotus represented the female and the fish the male, so this combination also implied the connection of male and female. 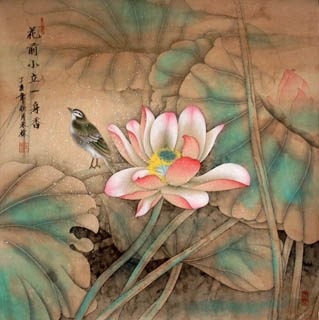 Chinese Mandarin Duck and Lotus Painting: 鸳鸯戏荷, 鸳鸯贵子. 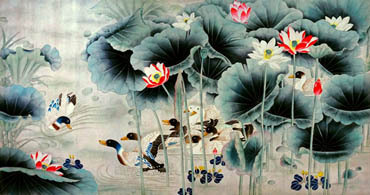 A pair of mandarin ducks, lotus flower and seeds. The mandarin ducks often apprear in pairs, so they symbolize the perfect couple since ancient China, and they are regarded as an auspicious symbol of love and marriage. 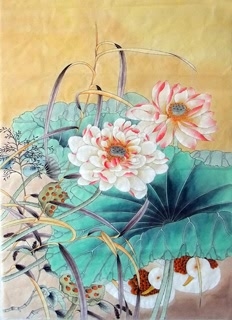 Lotus seed symbolizes "having lovely babies". 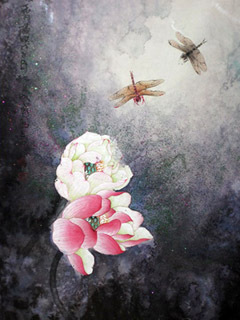 This combination implies a perfect couple living in harmony and mutual respect and growing old together. 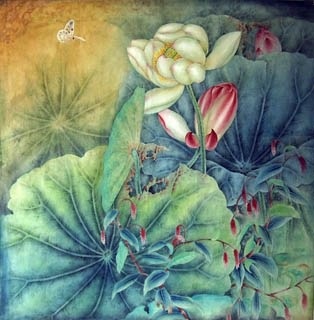 Chinese Egret /and Reed and Lotus Painting: 一路连科. 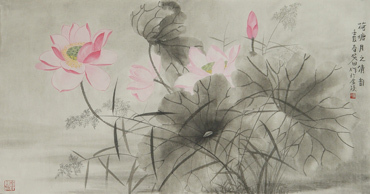 "Egret(鹭)" and "road(路)", "lotus(莲)" and "connect(连)", "reed(芦)" and "road(路)" are homonyms in Chinese, and reed is often growing together with lotus in groups(in Chinese, it sounds like the word "lian ke,连科"), so this combination symbolizes "success in the imperial examinations again and again" and "having a successful official career". 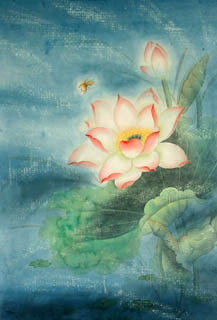 Chinese Fengshui Twin(2) Lotus Flowers on One(1) Stalk Painting: It symbolizes a couple living in harmony and happiness. 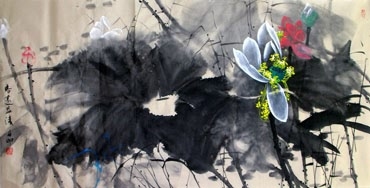 Chinese Lotus and Sweet Osmanthus(Osmanthus fragrans) Painting: 连生贵子. 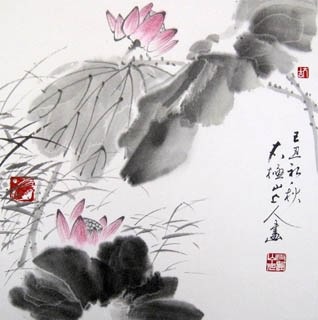 Lotus's flower and seeds are growing together, and "seed(籽)" sounds the same as the word "child(子)" in Chinese, "sweet osmanthus(桂)" and "nobility(贵)", so this combination symbolizes the perfect marriage and the prosperous family. 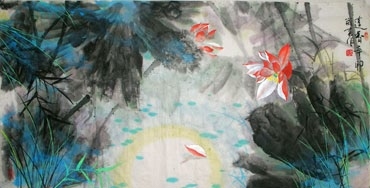 A child holding a Carp and a Lotus Painting: 吉庆有余/年年有余. 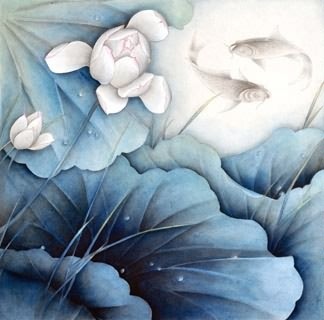 "Fish(鱼)" is homonymous with "surplus(余)" in Chinese, while "lotus(荷)" with "harmony(和)", so this combination symbolizes "living in affluence", "living in a wealthy family". 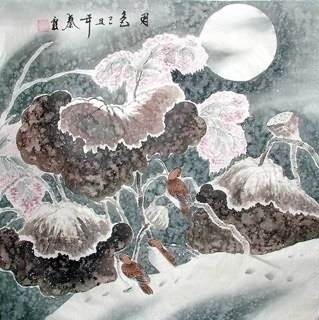 It expresses Chinese ancient people's good wishes for the affluence and abundance year after year. InkDance Price: USD 423 /GBP 347 /EUR 402 Sold, you can customize it. InkDance Price: USD 345 /GBP 283 /EUR 328 Sold, you can customize it. InkDance Price: USD 608 /GBP 499 /EUR 578 Sold, you can customize it.